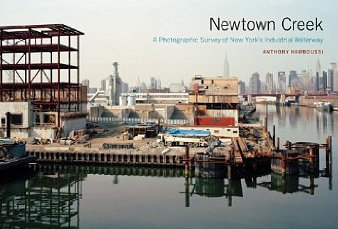 Newtown Creek, Photographs by Anthony Hamboussi. Published by Princeton Architectural Press, 2010. Princeton Architectural Press, New York, 2010. Hardbound. 432 pp., 237 color and 4 black & white illustrations, 9-1/2x6-1/2". Anthony Hamboussi's Newtown Creek: A Photographic Survey of New York's Industrial Waterway is a book of incongruous beauty. Hamboussi documents the chaotic landscape of an industrial wasteland with the eye of an obsessive collector, combining the gentle pastel washes of a seaside watercolorist with the surreal detailing of large-format photography. This exhaustive, five-year documentation of Newtown Creek, the waterway that forms a natural border between Queens and Brooklyn, is a must have for anyone even slightly enamored with America's decaying industrial landscape. Unfortunately, at 7 by 10 inches, the book's dimensions do not enhance the subtle detail and tonality of Hamboussi's photography. However, filled with around 200 photographs of vacant lots, concrete silos, warehouses, and railway tracks -- among other favorite urban sights -- each carefully labeled with historic and cartographic information and preceded by a map of the waterway and surrounding streets, the book's format does highlight the obsessive character of Hamboussi's work. It's a quality emphasized by the calm, rigid, and balanced compositions, by the super-fine detail of large format photography, and by the chronological sequencing of the photographs. Indeed, the end comes as a shock after the viewer has been lulled by the sweet, monotonous lullaby of rain-washed concrete and shimmering, polluted seas. Five years marks the end of the book, but the corner of New York City it documents keeps changing, waiting for another set of eyes to stop its time for a few thousandths of a second. Newtown Creek, by Anthony Hamboussi. Published by Princeton Architectural Press, 2010. At its heart, however, this book is a meditation about nature and humankind's relation to it. Even though Newtown Creek is the subject of the book, only about half of the photographs give us a glimpse of the waterway itself. The rest show the infrastructure (or the remains) of the numerous transportation, manufacturing, sewage treatment, and warehousing industries that developed in the area, largely as a result of Newtown Creek and its role as a convenient water source, transportation route, and dumping ground. However, even in the most barren and utilitarian portions of this concrete jungle, there always appears a touch of green from some obstinate weeds or a few golden leaves gracing the stubborn trees thriving along the banks of this proposed Superfund site. Indeed, the longer Hamboussi photographs the area, the more he allows nature to grow into his project. To the gray, uniform days are added snow, rain, glimpses of blue sky, and even one shy sunset. Alexandra Huddleston is an international documentary photographer whose most recent work focuses on exploring the transformation of traditional religious practices in the 21st century. In 2007 she spent a year in Timbuktu photographing the town’s legacy of traditional Islamic scholarship, supported by a Fulbright Student Islamic Civilizations grant. Her current work explores a pilgrim’s life along the Camino de Santiago in northern Spain. Huddleston earned her MS in broadcast journalism from the Columbia University School of Journalism in 2004, and her BA in studio art and East Asian studies at Stanford University in 2001. She currently works as an adjunct professor in the photography department at the Santa Fe Community College. Huddleston’s photographs have been included in the permanent collection of the Library of Congress’ Prints and Photographs Division as well as exhibited at numerous solo and groups exhibitions around the world.